Why we recommend disabling group messaging when using notify anywhere to send text to multiple recipients. If group messaging is not disabled , everyone in the TO list can see each others reply and their numbers, when sending text to multiple recipients or groups or event/class participants using Notify Anywhere. A restaurant " Yummy Tummy " selects all their contacts in Notify Anywhere and select send text option to send their promotional offer to all their selected contacts. When sending text they did not disable the group messaging and so the message is sent as a group message. Restaurant's customers start replying "Thank you note" to the original message. Because the message was sent as a group, the reply from each customer is sent back to the group; that means to EVERYONE (all recipients in the original message). This can be considered as a SPAM by some customers who do not wish to receive text from other customers. 1. From the Home screen, tap messages. 2. Tap the Menu icon in the upper right. 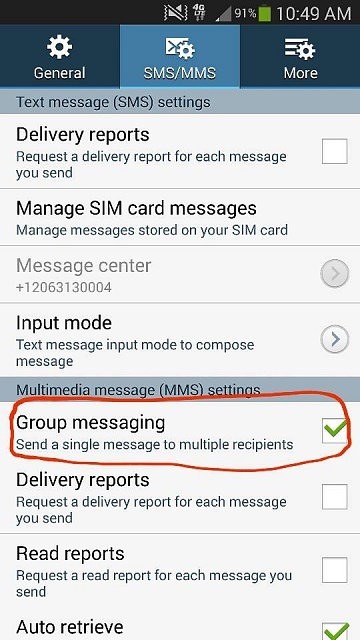 Please note steps to disable group messaging may vary on different phones and OS versions. � 2014 Notify Anywhere. All rights reserved.